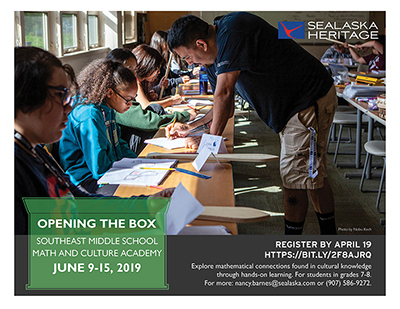 Through the program, which is one of SHI’s most popular summer camps, the institute will bring together about 40 students from Angoon, Hoonah, Klukwan, Prince of Wales Island, Kake and Juneau for seven days to develop their math skills through traditional cultural knowledge, art traditions and hands-on learning. Travel scholarships are available to 30 Alaska Native students in grades 7-8 who live outside of Juneau. Ten spots are open for students in grade 6 who live in Juneau. Travel, food, and accommodations will be provided at no cost to the participants. Students not from Juneau will stay on University of Alaska Southeast campus with chaperones, and students from Juneau will participate only during the day. The academy will run from June 9-15. The deadline to apply is April 19. The application is available at https://bit.ly/2F8AjrQ.